The Oder–Neisse line (Polish: granica na Odrze i Nysie Łużyckiej, German: Oder-Neiße-Grenze) is the international border between Germany and Poland. It was drawn at the Potsdam Conference in the aftermath of the Second World War and is primarily delineated along the Oder and Lusatian Neisse rivers in Central Europe, meeting the Baltic Sea to the north, just west of the Polish seaports of Szczecin and Świnoujście (German: Stettin and Swinemünde). All prewar German territory east of the line and within the 1937 German boundaries (23.8% of the former Weimar Republic) were placed under International Law Administrative status, with most of it being made part of newly-Communist Poland. The small remainder, consisting of the territory surrounding the German city of Königsberg (now renamed Kaliningrad, in honour of Soviet head of state Mikhail Kalinin) in northern East Prussia, was allocated to the Soviet Union (as Kaliningrad Oblast of the Russian SFSR, today the Russian Federation) after the war (pending the final World War II peace treaty for Germany). The vast majority of its native German population fled, or was killed or expelled by force. The Oder–Neisse line marked the border between the German Democratic Republic (East Germany) and Poland from 1950 to 1990. East Germany confirmed the border with Poland in 1950, while West Germany, after a period of refusal, finally accepted the border (with reservations) in 1970. In 1990 the newly reunified Germany and the Republic of Poland signed a treaty recognizing it as their border. The lower River Oder in Silesia was Piast Poland's western border from the 10th until the 13th century. From around the time of World War I, some proposed restoring this line, in the belief that it would provide protection against Germany. One of the first proposals was made in the Russian Empire. Later, when the Nazis gained power, the German territory to the east of the line was militarised by Germany with a view to a future war, and the Polish population faced Germanisation. The policies of Nazi Germany also encouraged nationalism among the German minority in Poland. 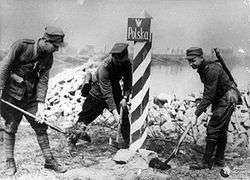 Before World War II, Poland's western border with Germany had been fixed under the terms of the Treaty of Versailles of 1919. It partially followed the historic border between the Holy Roman Empire and Greater Poland, but with certain adjustments that were intended to reasonably reflect the ethnic compositions of small areas near the traditional provincial borders. However Pomerelia and Upper Silesia had been divided, leaving areas populated by the Polish as well as other Slavic minorities on the German side and a significant German minority on the Polish side. 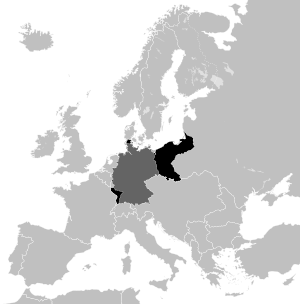 Moreover, the border left Germany divided into two portions by the Polish Corridor and the independent Free City of Danzig, which had an overwhelmingly German population, but was split from Germany to help secure Poland's access to the Baltic Sea. Between the wars, the concept of "Western thought" (myśl zachodnia) became popular among some Polish nationalists. The "Polish motherland territories" were defined by scholars like Zygmunt Wojciechowski as the areas included in Piast Poland in the 10th century. Some Polish historians called for the "return" of territories up to the river Elbe. The proponents of these ideas, in prewar Poland often described as a "group of fantasists", were organized in the National Party, which was also opposed to the then current government of Poland, the Sanacja. 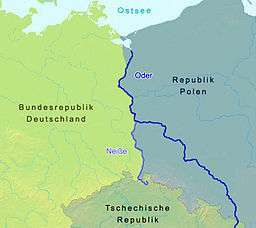 The proposal to establish the border along the Oder and Neisse was not seriously considered for a long time After World War II the Polish Communists, lacking their own expertise regarding the Western border, adopted the National Democratic concept of western thought. After Nazi Germany invaded and occupied Poland, some Polish politicians started to see a need to alter the border with Germany. A secure border was seen as essential, especially in the light of Nazi atrocities. During the war, Nazi Germany committed genocide against Poland's population, especially Poles and Jews, whom they classified as Untermenschen ("sub-humans"). Alteration to the western border was seen as a punishment for the Germans for their atrocities and a compensation for Poland. [Note 1] The participation in the genocide by German minorities and their paramilitary organizations, such as the Selbstschutz ("self defence"), and support for Nazism among German society also connected the issue of border changes with the idea of population transfers intended to avoid such events in the future. Initially the Polish government in exile envisioned territorial changes after the war which would incorporate East Prussia, Danzig (Gdańsk) and the Oppeln (Opole) Silesian region into post-war Poland, along with a straightening of the Pomeranian border and minor acquisition in the Lauenburg (Lębork) area. The border changes were to provide Poland with a safe border and to prevent the Germans from using Western Pomerania and East Prussia as strategic assets against Poland. [Note 2] Only with the changing situation during the war were these territorial proposals modified. 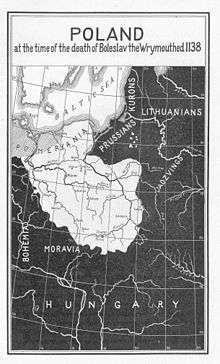 In October 1941 the exile newspaper Dziennik Polski postulated a postwar Polish western border that would include East Prussia, Silesia up to the Lausitzer Neisse and at least both banks of the Oder's mouth. While these territorial claims were regarded as "megalomaniac" by the Soviet ambassador in London, in October 1941 Stalin announced the "return of East Prussia to Slavdom" after the war. On 16 December 1941 Stalin remarked in a meeting with the British Foreign Minister Anthony Eden, though inconsistent in detail, that Poland should receive all German territory up to the river Oder. In May 1942 General Władysław Sikorski, Prime Minister of the Polish government in exile, sent two memoranda to the US government, sketching a postwar Polish western border along the Oder and Neisse (inconsistent about the Eastern Glatzer Neisse and the Western Lausitzer Neisse). However, the proposal was dropped by the government-in-exile in late 1942. In post-war Poland the government described the Oder–Neisse line as the result of tough negotiations between Polish Communists and Stalin. However, according to the modern Institute of National Remembrance, Polish aspirations had no impact on the final outcome; rather the idea of a westward shift of the Polish border was adopted synthetically by Stalin, who was the final arbiter in the matter. Stalin's political goals as well as his desire to foment enmity between Poles and Germans influenced his idea of a swap of western for eastern territory, thus ensuring control over both countries. As with before the war, some fringe groups advocated restoring the old border between Poland and Germany. At the Tehran Conference in late 1943 the Soviet leader Joseph Stalin raised the subject of Poland's western frontier and its extension to the River Oder. While the Americans were not interested in discussing any border changes at that time, Roosevelt agreed that in general the Polish border should be extended West to the Oder, while Polish eastern borders should be shifted westwards; he also admitted that it was due to elections at home he could not express his position publicly. British Foreign Minister Anthony Eden wrote in his diary that "A difficulty is that the Americans are terrified of the subject which [Roosevelt advisor] Harry [Hopkins] called 'political dynamite' for their elections. But, as I told him, if we cannot get a solution, Polish-Soviet relations six months from now, with Soviet army man armies in Poland, will be infinitely worse and elections nearer." Winston Churchill compared the westward shift of Poland to soldiers taking two steps "left close" and declared in his memoirs: "If Poland trod on some German toes that could not be helped, but there must be a strong Poland." The British government formed a clear position on the issue and at the first meeting of the European Advisory Commission on 14 January 1944, recommended "that East Prussia and Danzig, and possibly other areas, will ultimately be given to Poland" as well as agreeing on a Polish "frontier on the Oder". In February 1945, American and British officials met in Yalta and agreed on the basics on Poland's future borders. In the east, the British agreed to the Curzon line but recognised that the US might push for Lwów to be included in post-war Poland. In the west, Poland should receive part of East Prussia, Danzig, the eastern tip of Pomerania and Upper Silesia. President Franklin D. Roosevelt said that it would "make it easier for me at home" if Stalin were generous to Poland with respect to Poland's eastern frontiers. Winston Churchill said a Soviet concession on that point would be admired as "a gesture of magnanimity" and declared that, with respect to Poland's post-war government, the British would "never be content with a solution which did not leave Poland a free and independent state." With respect to Poland's western frontiers, Stalin noted that the Polish Prime Minister in exile, Stanisław Mikołajczyk, had been pleased when Stalin had told him Poland would be granted Stettin/Szczecin and the German territories east of the Western Neisse. Yalta was the first time that the Soviets openly declared support for a German-Polish frontier on the Western as opposed to the Eastern Neisse. Churchill objected to the Western Neisse frontier, saying that "it would be a pity to stuff the Polish goose so full of German food that it got indigestion." He added that many Britons would be shocked if such large numbers of Germans were driven out of these areas, to which Stalin responded that "many Germans" had "already fled before the Red Army." Poland's western frontier was ultimately left to be decided at the Potsdam Conference. Dominant ethnicities in and around Poland, 1931, according to Polish historian Henryk Zieliński. Originally, Germany was to retain Stettin, while the Poles were to annex East Prussia with Königsberg (now Kaliningrad). The Polish government had in fact demanded this since the start of World War II in 1939, because of East Prussia's strategic position that allegedly undermined the defense of Poland. Other territorial changes proposed by the Polish government were the transfer of the Silesian region of Oppeln and the Pomeranian regions of Danzig, Bütow and Lauenburg, and the straightening of the border somewhat in Western Pomerania. However, Stalin decided that he wanted Königsberg as a year-round warm water port for the Soviet Navy, and he argued that the Poles should receive Stettin instead. The prewar Polish government-in-exile had little to say in these decisions, but insisted on retaining the city of Lwów (Lvov, Lemberg, now L'viv) in Galicia. Stalin refused to concede, and instead proposed that all of Lower Silesia including Breslau (Polish: Wrocław) be given to Poland. Many Poles from Lwów would later be moved to populate the city. Westward shift of Poland after World War II. Blue line: Curzon Line of 8 December 1919. 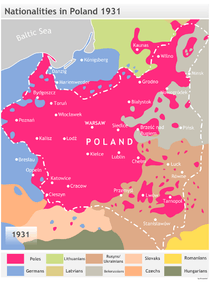 Pink areas: prewar German territory transferred to Poland after the war. Grey area: prewar Polish territory transferred to the Soviet Union after the war. The eventual border was not the most far-reaching territorial change that was proposed. There were suggestions to include areas further west so that Poland could include the small minority population of ethnic Slavic Sorbs who lived near Cottbus and Bautzen. The precise location of the western border was left open. The western Allies accepted in general that the Oder would be the future western border of Poland. Still in doubt was whether the border should follow the eastern or western Neisse, and whether Stettin, now Szczecin, should remain German or be placed in Poland (with an expulsion of the German population). Stettin was the traditional seaport of Berlin. It had a dominant German population and a small Polish minority that numbered 2,000 in the interwar period. The western Allies sought to place the border on the eastern Neisse at Breslau, but Stalin refused to budge. Suggestions of a border on the Bóbr (Bober) were also rejected by the Soviets. Nikita Khrushchev in his memoirs said: "I had only one desire – that Poland's borders were moved as far west as possible." Allied Occupation Zones in Germany from 1945 until 1949. At Potsdam, Stalin argued for the Oder–Neisse line on the grounds that the Polish Government demanded this frontier and that there were no longer any Germans left east of this line. Later the Russians admitted that at least "a million Germans" (still far lower than the true number) still remained in the area at that time. Several Polish Communist leaders appeared at the conference to advance arguments for an Oder–Western Neisse frontier. The port of Szczecin was demanded for Eastern European exports. If Szczecin was Polish, then "in view of the fact that the supply of water is found between the Oder and the Lausitzer Neisse, if the Oder's tributaries were controlled by someone else the river could be blocked." Soviet forces had initially expelled Polish administrators who tried to seize control of Szczecin in May and June, and the city was governed by a German communist-appointed mayor, under the surveillance of the Soviet occupiers, until 5 July 1945. James Byrnes – who had been appointed as U.S. Secretary of State earlier that month – later advised the Soviets that the U.S. was prepared to concede the area east of the Oder and the Eastern Neisse to Polish administration, and for it not to consider it part of the Soviet occupation zone, in return for a moderation of Soviet demands for reparations from the Western occupation zones. A Nysa Kłodzka boundary would have left Germany with roughly half of Silesia – including the majority of Wrocław (Breslau), the former provincial capital and the largest city in the region. The Soviets insisted that the Poles would not accept this. The Polish representatives (and Stalin) were in fact willing to concede a line following the Oder-Bober-Queiss (Odra-Bóbr-Kwisa) rivers through Żagań (Sagan) and Lubań (Lauban), but even this small concession ultimately proved unnecessary, since on the next day Byrnes told the Soviet Foreign Minister Vyacheslav Molotov that the Americans would reluctantly concede to the Western Neisse. Byrnes' concession undermined the British position, and although the British Foreign Secretary Ernest Bevin raised objections, the British eventually agreed to the American concession. In response to American and British statements that the Poles were claiming far too much German territory, Stanisław Mikołajczyk argued that "the western lands were needed as a reservoir to absorb the Polish population east of the Curzon Line, Poles who returned from the West, and Polish people who lived in the overcrowded central districts of Poland." The U.S. and the U.K. were also negative towards the idea of giving Poland an occupation zone in Germany. However, on 29 July, President Truman handed Molotov a proposal for a temporary solution whereby the U.S. accepted Polish administration of land as far as the Oder and eastern Neisse until a final peace conference determined the boundary. In return for this large concession, the U.S. demanded that "each of the occupation powers take its share of reparations from its own [Occupation] Zone and provide for admission of Italy into the United Nations." The Soviets stated that they were not pleased "because it denied Polish administration of the area between the two Neisse rivers." On 29 July Stalin asked Bolesław Bierut, the head of the Soviet-controlled Polish government, to accept in consideration of the large American concessions. The Polish delegation decided to accept a boundary of the administration zone at "somewhere between the western Neisse and the Kwisa". Later that day the Poles changed their mind: "Bierut, accompanied by Rola-Zymierski, returned to Stalin and argued against any compromise with the Americans. Stalin told his Polish protégés that he would defend their position at the conference." Finally on 2 August 1945, the Potsdam Agreement of the United States, the United Kingdom, and the Soviet Union, in anticipation of the final peace treaty, placed the German territories east of the Oder–Neisse line formally under Polish administrative control. It was also decided that all Germans remaining in the new and old Polish territory should be expelled. Those territories were known in Poland as the Regained or Recovered Territories, a term based on the claim that they were in the past the possession of the Piast dynasty of Polish kings, Polish fiefs or included in the parts lost to Prussia during the Partitions of Poland. The term was widely exploited by Propaganda in the People's Republic of Poland. The creation of a picture of the new territories as an "integral part of historical Poland" in the post-war era had the aim of forging Polish settlers and repatriates arriving there into a coherent community loyal to the new Communist regime. The term was in use immediately following the end of World War II when it was part of the Communist indoctrination of the Polish settlers in those territories. The final agreements in effect compensated Poland with 112,000 km2 (43,000 sq mi) of former German territory in exchange for 187,000 km2 (72,000 sq mi) of land lying east of the Curzon Line – Polish areas occupied by the Soviet Union. Poles and Polish Jews from the Soviet Union were the subject of a process called "repatriation" (settlement within the territory of post-war Poland). Not all of them were repatriated: some were imprisoned or deported to work camps in Siberia or Kazakhstan. One reason for this version of the new border was that it was the shortest possible border between Poland and Germany. It is only 472 km (293 miles) long, from the northernmost point of the Czech Republic to one of the southernmost points of the Baltic Sea at the Oder estuary. Oder Lagoon area with border on western bank of the Oder, city of Szczecin not depicted. "The Russian-dominated Polish Government has been encouraged to make enormous and wrongful inroads upon Germany, and mass expulsions of millions of Germans on a scale grievous and undreamed-of are now taking place." US Department of State Demographics map from 10 January 1945 Germany – Poland Proposed Territorial Changes, based in part on German prewar population census. Was used for border discussions at the Potsdam conference later in 1945. Not only were the German territorial changes of the Nazis reversed, but the border was moved westward, deep into territory which had been in 1937 part of Germany with an almost exclusively German population. The new line placed almost all of Silesia, more than half of Pomerania, the eastern portion of Brandenburg, a small area of Saxony, the former Free City of Danzig and the southern two-thirds of East Prussia (Masuria and Warmia) within Poland (see Former eastern territories of Germany). The northeastern third of East Prussia was directly annexed by the Soviet Union, with the Memelland becoming part of the Lithuanian SSR and the bulk of the territory forming the new Kaliningrad Oblast of the Russian SFSR. These territorial changes were followed by large-scale population transfers, involving 14 million people all together from the whole of Eastern Europe, including many people already shifted during the war. Nearly all remaining Germans from the territory annexed by Poland were expelled, while Polish persons who had been displaced into Germany, usually as slave laborers, returned to settle in the area. In addition to this, the Polish population originating from the eastern half of the former Second Polish Republic, now annexed by the Soviet Union, was mostly expelled and transferred to the newly acquired territories. Most Poles supported the new border, mostly out of fear of renewed German aggression and German irredentism. The border was also presented as a just consequence for the Nazi German state's initiation of World War II and the subsequent genocide against Poles and the attempt to destroy Polish statehood, as well as for the territorial losses of eastern Poland to the Soviet Union, mainly western Ukraine and Belarus. It has been asserted that resentment towards the expelled German population on the part of the Poles was based on the fact that the majority of that population was loyal to the Nazis during the invasion and occupation, and the active role some of them played in the persecution and mass murder of Poles and Jews. These circumstances allegedly have impeded sensitivity among Poles with respect to the expulsion committed during the aftermath of World War II. The new order was in Stalin's interests, because it enabled the Soviet Communists to present themselves as the primary maintainer of Poland's new western border. It also provided the Soviet Union with territorial gains from part of East Prussia and the eastern part of the Second Republic of Poland. "At Potsdam specific areas which were part of Germany were provisionally assigned to the Soviet Union and to Poland, subject to the final decisions of the Peace Conference. 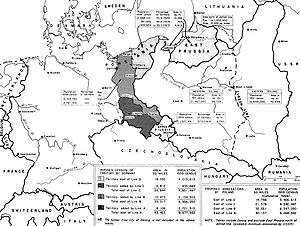 [...] With regard to Silesia and other eastern German areas, the assignment of this territory to Poland by Russia for administrative purposes had taken place before the Potsdam meeting. The heads of government agreed that, pending the final determination of Poland's western frontier, Silesia and other eastern German areas should be under the administration of the Polish state and for such purposes should not be considered as a part of the Soviet zone of occupation in Germany. However, as the Protocol of the Potsdam Conference makes clear, the heads of government did not agree to support at the peace settlement the cession of this particular area. The Soviets and the Poles suffered greatly at the hands of Hitler's invading armies. As a result of the agreement at Yalta, Poland ceded to the Soviet Union territory east of the Curzon Line. Because of this, Poland asked for revision of her northern and western frontiers. The United States will support revision of these frontiers in Poland's favor. However, the extent of the area to be ceded to Poland must be determined when the final settlement is agreed upon." The speech was met with shock in Poland and Deputy Prime Minister Mikołajczyk immediately issued a response declaring that retention of Polish territories based on the Oder–Neisse line was matter of life and death. Byrnes, who accepted Western Neisse as provisional Polish border, in fact did not state that such a change would take place (as was read by Germans who hoped for support of their revisionist goals). The purpose of the speech and associated US diplomatic activities was as propaganda aimed at Germany by Western Powers, who could blame Polish-German border and German expulsions on Moscow alone. In the late 1950s, by the time of Dwight D. Eisenhower's Presidency, the United States had largely accepted the Oder–Neisse line as final and did not support German demands regarding the border, while officially declaring a need for a final settlement in a peace treaty. In the mid-1960s the U.S. government accepted the Oder–Neisse line as binding and agreed that there would be no changes to it in the future. German revisionism regarding the border began to cost West Germany sympathies among its western allies. In 1959 France officially issued a statement supporting the Oder–Neisse line, which created controversy in West Germany. 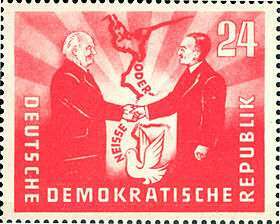 The East German Socialist Unity Party (SED), founded 1946, originally rejected the Oder–Neisse line. Under Soviet occupation and heavy pressure by Moscow, the official phrase Friedensgrenze (border of peace) was promulgated in March–April 1947 at the Moscow Foreign Ministers Conference. The German Democratic Republic and Poland's Communist government, signed the Treaty of Zgorzelec in 1950, recognizing the Oder–Neisse line, officially designated by the Communists as the "Border of Peace and Friendship". In 1952, recognition of the Oder–Neisse line as a permanent boundary was one of Stalin's conditions for the Soviet Union to agree to a reunification of Germany (see Stalin Note). The offer was rejected by the West German Chancellor Konrad Adenauer. German territories lost in both World Wars are shown in black, present-day Germany is marked dark grey. 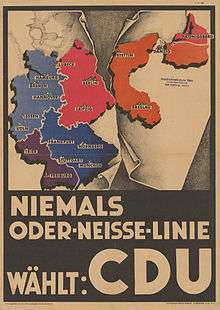 CDU's election poster (1947): "Never Oder-Neisse line – vote CDU"
To Hans Peter Schwarz, Adenauer's refusal to accept the Oder–Neisse line was in large part motivated by domestic politics, namely his desire to win the votes of the right-wing nationalists who once voted for the Nazis to the CDU, and who formed a powerful domestic lobby known as the expellee lobby. The various groups that represented the Germans who fled or were expelled from Eastern Europe formed a powerful lobby in the Federal Republic in the 1950s that no politician was willing to anger as 16% of the electorate in 1950 were people who fled or were expelled after the war. As a result, the CDU, the CSU, the FDP and the SPD all issued statements opposing the Oder–Neisse line and supporting Heimatrecht ("right to one's homeland", i.e. that the expellees be allowed to return to their former homes). Adenauer greatly feared the power of the expellee lobby, and told his cabinet in 1950 that he was afraid of "unbearable economic and political unrest" if the government did not champion all of the demands of the expellee lobby. In addition, Adenauer's rejection of the Oder–Neisse line was intended to be a deal-breaker if negotiations ever began to reunite Germany on terms that Adenauer considered unfavorable such as the neutralization of Germany as Adenauer knew well that the Soviets would never consider revising the Oder–Neisse line. Finally Adenauer's biographer, the German historian Hans Peter Schwarz has argued that Adenauer may have genuinely believed that Germany had the right to retake the land lost east of the Oder and Neisse rivers, despite all of the image problems this created for him in the United States and western Europe. By contrast, the Finnish historian Pertti Ahonen—citing numerous private statements made by Adenauer that Germany's eastern provinces were lost forever and expressing contempt for the expellee leaders as delusional in believing that they were actually going to return one day to their former homes—has argued that Adenauer had no interest in really challenging the Oder–Neisse line. Ahonen wrote that Adenauer "saw his life's work in anchoring the Federal Republic irrevocably to the anti-Communist West and no burning interest in East European problems—or even German reunification." Adenauer's stance on the Oder–Neisse line was to create major image problems for him in the Western countries in the 1950s, where many regarded his revanchist views on where Germany's eastern borders ought to be with considerable distaste, and only the fact that East Germany was between the Federal Republic and Poland prevented this from becoming a major issue in relations with the West. 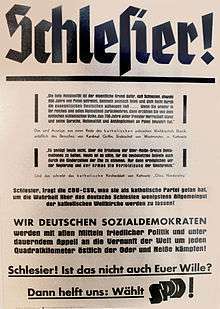 SPD's election poster (1949): "Silesians – We German Socialdemocrats will fight with all means of peaceful politics and in constant appeal on the sanity of the world for every single square kilometer east of Oder and Neisse"
On 1 May 1956, the West German Foreign Minister Heinrich von Brentano admitted during a press conference in London that the Federal Republic's stance on the Oder–Neisse line was "somewhat problematic", and suggested that the Federal Republic should recognize the Oder–Neisse line in exchange for the Soviet Union allowing German reunification. Brentano's remark caused such an uproar with the expellee leaders arguing that he should resign, that Adenauer was forced to disallow his foreign minister, and Brentano only kept his job by claiming that he was misquoted by the British press. In private, Brentano was willing to accept the Oder–Neisse line as the price of reunification, and was not misquoted in London as he claimed afterwards. Away from the public limelight in a conversation with the Canadian ambassador Charles Ritchie in June 1956, Brentano called the leaders of the expellee groups "unteachable nationalists" who had learned nothing from World War II, and who did not have the right to control the Federal Republic's policy towards Eastern Europe by vetoing policy changes they disliked. Brentano's press conference was meant by Adenauer to be a trial balloon to see if the Federal Republic could have a more flexible policy towards Eastern Europe. The furious protests set off by Brentano's press conference convinced Adenauer that he did not have the domestic support for such a policy, and that the current policy of opposing the Oder–Neisse line would have to continue. This caused considerable disappointment with Adenauer's Western allies, who had been applying strong pressure behind the scenes and would continue to apply such pressure for the rest of the 1950s for Bonn to recognize the Oder–Neisse line. This pressure become especially acute after the "Polish October" crisis of 1956 brought to power Władysław Gomułka as Poland's new leader. Gomułka was a Communist, but also a Polish nationalist, and it was believed possible in Washington that a split could be encouraged between Moscow and Warsaw if only Bonn would recognize the Oder–Neisse line. Because the Federal Republic's refusal to recognize the Oder–Neisse line together with the presence of such Nazi-tainted individuals like Theodor Oberländer in Adenauer's cabinet, Gomułka was obsessed with the fear that one day the Germans would invade Poland again, which would mean a return to the horrors of the German occupation. Gomułka feared the Germans more than he disliked the Russians, and thus he argued in both public and in private that it was necessary to keep Soviet troops in Poland to guard against any future German revanchism. Gomułka felt sincerely threatened by the revanchist statements put out by the Adenauer government, and believed the alliance with the Soviet Union was the only thing stopping the threat of a new German invasion. Gomułka told the 8th Plenum on 19 October 1956 that: "Poland needs friendship with the Soviet Union more than the Soviet Union needs friendship with Poland...Without the Soviet Union we cannot maintain our borders with the West". During his meetings with Nikita Khrushchev during the Polish October crisis, Gomułka stressed that though he wanted Poland to take a more independent line within the Soviet bloc, he was never break with Moscow because of his fears of future German aggression based on their statements rejecting the Oder–Neisse line. Because Gomułka's obsession with the Oder–Neisse line and his reputation as a Polish nationalist who spoke of a "Polish road to socialism" independent of Moscow, it was believed possible by the Americans at the time that Gomułka might follow Tito's example in 1948 if only Adenauer could be persuaded to accept the Oder–Neisse line. One scholar wrote in 1962 that most Poles deeply disliked Communism, but were willing to accept Gomułka's regime as the lesser evil because they believed Gomułka's warnings that if without the Red Army, the Germans would invade again. Such was the extent of Polish fears about German revanchism that as late as February 1990 the Polish Prime Minister Tadeusz Mazowiecki stated in a speech that Red Army might have to stay in Poland until Germany had promised to firmly recognize the Oder–Neisse line as the final frontier between Germany and Poland. In 1963 the German Social Democratic opposition leader Willy Brandt said that "abnegation is betrayal", but it was Brandt who eventually changed West Germany's attitude with his policy of Ostpolitik. In 1970 West Germany signed treaties with the Soviet Union (Treaty of Moscow) and Poland (Treaty of Warsaw) recognizing Poland's Western border at the Oder–Neisse line as current reality, and not to be changed by force. This had the effect of making family visits by the displaced eastern Germans to their lost homelands now more or less possible. Such visits were still very difficult, however, and permanent resettlement in the homeland, now Poland, remained impossible. In 1989, another treaty was signed between Poland and East Germany, the sea border was defined, and a dispute from 1985 was settled. In March 1990, the West German Chancellor Helmut Kohl caused a storm, when he suggested that a reunified Germany would not accept the Oder–Neisse line, and implied that the Federal Republic might wish to restore the frontier of 1937, by force if necessary. Kohl further added that in a statement of 1 March 1990 that he would only recognize the Oder–Neisse line if Poland promised to pay compensation to the Germans expelled after 1945 and if Poland promised not to seek reparations for the sufferings of Polish slave labourers in Germany and reparations for the damage done by German forces to Poland during World War II. After's Kohl's note caused a massive international backlash that threatened to derail the process for German reunification, Kohl hastily changed track, and said that a reunified Germany would accept the Oder–Neisse line after all, and that he would not seek to link recognizing the Oder–Neisse line to talks about compensation. In November 1990, after German reunification, the Federal Republic of Germany and the Republic of Poland signed a treaty confirming the border between them, as requested by the Treaty on the Final Settlement With Respect to Germany. Earlier, Germany had amended its constitution and abolished Article 23 of West Germany's Basic Law (on which reunification was based), which could have been used to claim the former German eastern territories. The 1990 German-Polish Border Treaty finalizing the Oder–Neisse line as the Polish-German border came into force on 16 January 1992, together with a second one, a Treaty of Good Neighbourship, signed in June 1991, in which the two countries, among other things, recognized basic political and cultural rights for both the German and the Polish minorities living on either side of the border. After 1990, approximately 150,000 Germans still resided in the areas transferred to Poland, mainly in the Opole Voivodeship, with a smaller presence in regions such as Lower Silesia and Warmia-Masuria. There are 1.5 million Poles or ethnic Poles living in Germany, including both recent immigrants and the descendants of Poles that settled in Germany many generations ago. The Lusatian Neisse dividing German Görlitz (right) from Polish Zgorzelec (left); formerly both constituted the city of Görlitz. The border divided several cities into two parts – Görlitz/Zgorzelec, Guben/Gubin, Frankfurt/Słubice and Bad Muskau/Łęknica. Millions visited the neighbouring country (either Poland or East Germany) during the years 1971–1980. The East German economy was threatened by overconsumption of Polish tourists, who came to East Germany to buy cheaper products that the socialist economy could not provide in abundance on either side of the border; and the Poles also became politically dangerous for the GDR government by the time of the 1980 Solidarity strikes. Poland joined the Schengen Area in 2007. This meant that all passport checks were removed along the border in December 2007. The limitations on Poles working in Germany expired in April 2011. Wikimedia Commons has media related to Germany-Poland border. ↑ "Przesunięcie granicy zachodniej na korzyść Polski było uważane także za jedną z form ukarania Niemców za popełnione zbrodnie i zadośćuczynienia Polsce." ↑ "Nowa Granica miała osłabić korzystny dotąd układ strategiczny wykorzystywany przeciwko Polsce (Prusy Wschodnie, Pomorze Zachodnie)." ↑ "Although the Polish and German governments signed a treaty in 1970..., the United States withheld the formal recognition of the Oder-Neisse until the revolutionary changes of 1989 and 1990, ..."
↑ Article VIII. B of the Potsdam Agreement: "In conformity with the agreement on Poland reached at the Crimea Conference the three heads of government have sought the opinion of the Polish Provisional Government of National Unity in regard to the accession of territory in the north 'end west which Poland should receive. The President of the National Council of Poland and members of the Polish Provisional Government of National Unity have been received at the Conference and have fully presented their views. The three heads of government reaffirm their opinion that the final delimitation of the western frontier of Poland should await the peace settlement. The three heads of government agree that, pending the final determination of Poland's western frontier, the former German territories cast of a line running from the Baltic Sea immediately west of Swinamunde, and thence along the Oder River to the confluence of the western Neisse River and along the Western Neisse to the Czechoslovak frontier, including that portion of East Prussia not placed under the administration of the Union of Soviet Socialist Republics in accordance with the understanding reached at this conference and including the area of the former free city of Danzig, shall be under the administration of the Polish State and for such purposes should not be considered as part of the Soviet zone of occupation in Germany." ↑ "In den Verhandlungen mit der polnischen Regierung mußte die Frage der Anerkennung der Oder-Neiße-Linie ausgeklammert warden, denn nach der Entscheidung des Bundesverfassungsgerichts von 1975 bestanden das Deutsche Reich in seinen Grenzen von 1937 und die Viermächteverantwortung für ganz Deutschland solange fort, bis ein förmlicher Friedensvertrag geschlossen worden sei." ↑ "Politiker und politische Gruppen verwiesen auf die Abmachungen der Potsdamer Konferenz von 1945, denen zufolge die endgültige Regelung der Oder-Neiße-Frage einem endgültigen Friedensvertrag für ganz Deutschland vorbehalten werden sollte." ↑ "Die Gebiete östlich von Oder und Neiße sind ebenso wie das übrige Reichsgebiet in den Grenzen vom 31. 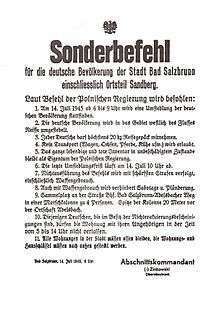 Dezember 1937 von den Siegermächten bei Kriegsende nicht annektiert worden. Im Vorspruch der "Erklärung" vom 5. Juni 1945, welche die Regierungen des Vereinigten Königreichs, der Vereinigten Staaten von Amerika und der Union der Sozialistischen Sowjetrepubliken sowie die provisorische Regierung der Französischen Republik "in Anbetracht der Niederlage Deutschlands und der Übernahme der obersten Regierungsgewalt hinsichtlich Deutschlands" abgegeben haben, heißt es: "Die Übernahme ... der besagten Regierungsgewalt und Befugnisse bewirkt nicht die Annektierung Deutschlands" (Amtsblatt des Kontrollrats in Deutschland, Ergänzungsblatt Nr. 1 S. 7). Auf der Potsdamer Konferenz (Juli/August 1945) kamen Großbritannien, die Sowjetunion und die Vereinigten Staaten von Amerika überein, die deutschen Gebiete östlich von Oder und Neiße einer Sonderregelung zu unterwerfen, die von der im übrigen Reichsgebiet eingerichteten Besatzungsherrschaft deutlich abwich. Nach den Abschnitten VI und IX des als "Mitteilung über die Dreimächtekonferenz von Berlin" bezeichneten Protokolls vom 2. August 1945 (oft Potsdamer Abkommen genannt) wurden die deutschen Ostgebiete "vorbehaltlich der endgültigen Bestimmung der territorialen Fragen bei der Friedensregelung" teilweise unter sowjetische und teilweise unter polnische "Verwaltung" gestellt ...(AmtsblattBVerfGE 40, 141 (157)BVerfGE 40, 141 (158) des Kontrollrats in Deutschland, Ergänzungsblatt Nr. 1 S. 17 f.). Die sich aus dem Vorbehalt der Friedensregelung ergebende Vorläufigkeit dieser Gebietszuweisung wurde nach dem Abschluß der Potsdamer Konferenz von der Sowjetunion und Polen zunächst respektiert. Der sowjetisch-polnische Vertrag vom 16. August 1945, der den Verlauf der sowjetisch-polnischen Grenzlinie in Ostpreußen beschreibt, wiederholt in seinem Art. 3 ausdrücklich den Friedensvertragsvorbehalt unter Bezugnahme auf die Potsdamer Konferenz (United Nations Treaty Series 10 II Nr. 61 S. 196). 66 Die drei Westmächte haben einer endgültigen Zuweisung der deutschen Ostgebiete an die Sowjetunion und Polen nicht zugestimmt. Nach der Ziffer VI des Protokolls über die Beschlüsse der Potsdamer Konferenz haben Großbritannien und die Vereinigten Staaten lediglich in Aussicht gestellt, den "grundsätzlich" akzeptierten "Vorschlag der Sowjetregierung hinsichtlich der endgültigen Übergabe der Stadt Königsberg und des anliegenden Gebiets an die Sowjetunion" vorbehaltlich einer noch vorzunehmenden Festlegung des "genauen Grenzverlaufs" bei der "bevorstehenden Friedensregelung" zu "unterstützen". ↑ Polacy – wysiedleni, wypędzeni i wyrugowani przez III Rzeszę", Maria Wardzyńska, Warsaw 2004. ↑ Anthony Eden, The Reckoning (London, 1965) p. 427. ↑ Churchill, Winston (1986). Closing the ring. Mariner books. ISBN 9780395410592. ↑ US Dept. of State, Foreign Relations of the US, The Conferences at Malta and Yalta, 1945, Third Plenary Meeting 6 February 1945, Bohlen Minutes, p. 669. ↑ Tadeusz Białecki, "Historia Szczecina" Zakład Narodowy im. Ossolińskich, 1992 Wrocław. Pages 9, 20–55, 92–95, 258–260, 300–306. ↑ US Dept of State, Foreign Relations of the US, The Conference of Berlin (Potsdam) 1945, vol. II pp. 1522–1524. ↑ Heitmann, Clemens Die Stettin-Frage: Die KPD, die Sowjetunion und die deutsch-polnische Grenze 1945. Zeitschrift für Ostmitteleuropa-Forschung, 2002, vol. 51, no1, pp. 25–63. ↑ US Dept of State, Foreign Relations of the US, The Conference of Berlin (Potsdam) 1945, vol. II p. 480. ↑ US Dept of State, Foreign Relations of the US, The Conference of Berlin (Potsdam) 1945, vol. II p. 519. ↑ Peter H. Merkl, German Unification, 2004 Penn State Press, p. 338. ↑ Timmermann, Heiner; Ihmel-Tuchel, Beate (1997). Potsdam 1945 (in German). Duncker & Humblodt. p. 307. ISBN 3-428-08876-X. ↑ Stokłosa, Katarzyna (2011). Polen und die deutsche Ostpolitik 1945– 1990 (in German). Vandenhoeck & Ruprecht. p. 494. ISBN 978-3-525-30000-8. ↑ Lepp, Claudia (2005). Tabu der Einheit – Die Ost-West-Gemeinschaft der evangelischen Christen und die deutsche Teilung (1945–1969) (in German). Vandenhoeck & Ruprecht. p. 436. ISBN 3-525-55743-4. ↑ Entscheidungen des Bundesverfassungsgerichts, Band 40 (in German). 1975. pp. 157, 158. 1 2 3 4 5 Schwarz, Hans Peter Konrad Adenauer: From the German Empire to the Federal Republic, 1876–1952, Oxford: Berghahn Books, 1995 page 638. ↑ Weinberg, Gerhard Germany, Hitler, and World War II: Essays in Modern German and World History, Cambridge: Cambridge University Press, 1996 page 11. ↑ Clemens, Clay (6 March 1990). "Kohl Performs A Balancing Act on German-Polish Boundary Line". Daily Press. Retrieved 2014-02-22. ↑ Merkl, Peter H. German Unification in the European Context University Park: Penn State Press, 2010 page 132. ↑ Kimmo Katajala; Maria Lähteenmäki (2012). Imagined, Negotiated, Remembered: Constructing European Borders and Borderlands. LIT Verlag Münster. p. 204. ISBN 978-3-643-90257-3. ↑ Paul Ganster (1 January 1997). Borders and Border Regions in Europe and North America. SCERP and IRSC publications. p. 178. ISBN 978-0-925613-23-3. ↑ Sven Tägil (1 January 1999). Regions in Central Europe: The Legacy of History. C. Hurst & Co. Publishers. p. 244. ISBN 978-1-85065-552-7. ↑ Paulina Bren; Mary Neuburger (8 August 2012). Communism Unwrapped: Consumption in Cold War Eastern Europe. Oxford University Press, USA. pp. 377–385. ISBN 978-0-19-982766-4. Ahonen, Pertti (1998). "Domestic constraints on West German Ostpolitik: the role of the expellee organizations in the Adenauer era". Central European History. 31 (1): 31–63. doi:10.1017/S0008938900016034. JSTOR 4546774. Allen, Debra J. (2003). The Oder–Neisse line: the United States, Poland, and Germany in the Cold War. Westport: Praeger. ISBN 978-0-313-32359-1. Fahlbusch, Michael; Haar, Ingo (2005). German scholars and ethnic cleansing, 1919–1945. Berghahn Books. ISBN 1-57181-435-3. Faraldo, José M. (2008). Europe, nationalism, communism: Essays on Poland. Internationaler Verlag der Wissenschaften. ISBN 9783631567623. Granville, Johanna (2002). "From the archives of Warsaw and Budapest: a comparison of the events of 1956". East European Politics and Societies. 16 (2): 521–563. doi:10.1177/088832540201600208. Granville, Johanna (2003). "Reactions to the events of 1956: new findings from the Budapest and Warsaw archives". Journal of Contemporary History. 38 (2): 261–290. doi:10.1177/0022009403038002133. JSTOR 3180658. Hackmann, Jörg (1996). Ostpreussen und Westpreussen in deutscher und polnischer Sicht (in German). Deutsches Historisches Institut Warschau/Niemiecki Instytut Historyczny w Warszawie. ISBN 3-447-03766-0. Ingrao, Charles W.; Szabo, Franz A. J. (2008). The Germans and the East. Purdue University Press. ISBN 978-1-55753-443-9. Laufer, Jochen (2009). Pax Sovietica: Stalin, die Westmächte und die deutsche Frage 1941–1945 [Pax Sovietica: Stalin, Western powers and the German question, 1941–1945] (in German). Böhlau. ISBN 978-3-412-20416-7. Lukas, Richard C. (1982). Bitter Legacy: Polish–American Relations in the Wake of World War II. University Press of Kentucky. ISBN 9780813114606. Piskorski, Jan M. (2003). Traditionen – Visionen: 44. Deutscher Historikertag in Halle an der Saale 2002 (in German). Oldenbourg. ISBN 3-486-56769-1. Thum, Gregor (2011). Uprooted: How Breslau became Wroclaw during the century of expulsions. Princeton University Press. ISBN 978-0-691-14024-7. Wolff-Powęska, Anna (1993). Polacy wobec Niemców. Instytut Zachodni. ISBN 9788385003670. Closing The Ring Winston Churchill; Excerpt on the Teheran conference, from his memoirs. Speaking Frankly James F. Byrnes; Excerpt on the Yalta conference, from his memoirs. Triumph and Tragedy Winston Churchill; Excerpt on the Yalta conference, from his memoirs.